I was a runner up in a stencil design competition for Crown. 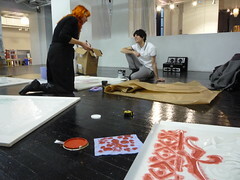 Today was their press evening where our stencils were displayed for the first time. I had a lovely morning painting my stencil onto canvas and returned this evening for a bit of a party. I enjoyed taking part in this project and thank you to Crown and Helen at the Stencil Library. All designs by RCA students will be available here soon. Thanks for the thanks. It was a pleasure to meet you all and I thought your stencil designs were fab. I am loving your knitwear too. I’ll look forward to your stencil designs being launched by Crown and I’ll be sure to blog them.